Great art is often beautiful to behold: Monet’s Water Lilies, symphonies by Mozart and ballets danced by Baryshnikov are all pleasing to the senses. But art may also serve as a vehicle for political or social expression. The powerful work of artist-teachers Michael Kalmbach and Lori Crawford pulled me in off the gallery floor right into their worlds and viewpoints. Step into the gallery of the Delaware College of Art and Design (DCAD) and you get a fabulous treat. Until October 15, the faculty and staff exhibit is on display. Jewelry, 3-D design, illustration and painting are among the mediums presented by these talented artists. Michael Kalmbach, founding member of the New Wilmington Art Association, and winner of this year’s Christi Award for Outstanding Achievement in Arts Advocacy, was there with one of his works. Presidential Auras, McCain, 2008, (pictured with Michael and son Thurman) is from his Presidential Auras series, which also includes images of Mitt Romney, Hillary Clinton, and Barack Obama. It’s hard not to laugh out loud when you see the life-sized cardboard cut-out of McCain that Kalmbach has transformed into a painting using acrylic paint, a felt backdrop, and a plastic covering. McCain stares out with what Kalmbach describes as a menacing glare, while the pattern of acrylic paint creates his “aura”: a drape resembling a Native American fur garb. Kalmbach explained how he calculated saving the creation of his least favorite candidate’s painting for last, when Kalmbach’s technique would be perfected. Lori Crawford, an associate professor of art at Delaware State University, was awarded the 2008 Individual Artist Fellowship in Works on Paper from the Delaware Division of the Arts. Her three-dimensional works on display at the Mezzanine Gallery in the Carvel Building include computer photographs of women printed on brown paper bags. Crawford explained to me how, years ago in the South, a person’s skin color might be compared to the shade of a brown paper bag. Church doors were sometimes painted that same color, so that parishioners might be assessed before being allowed to enter. Each one of Crawford’s bags shares a woman’s personal experience with race as well as her photograph. One woman speaks of the Vitiligo affecting her skin’s pigmentation. Another woman, of mixed heritage, expresses her exasperation over always having to explain and qualify her ethnic background. Crawford has interviewed women all over the world for this project she thought would end with the completion of her thesis in 1996. 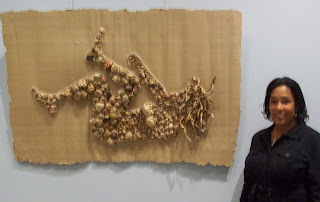 She also fashions reliefs of women in action poses from crumpled brown paper bags, with titles like The Bag Lady: Stomping Out Racism and The Bag Lady: Kicking out Sexism. (Pictured with Lori Crawford.) Her works are on display until September 25, 2009. For years, I have viewed the various art works of Lori Crawford at different locations in Delaware_ Dover, Wilmington, and Rehoboth. And, I know she has had exhibits in Washington DC, Chicago IL, Alanta GA, and Birmingham AL. Her art works always impress me by showing a sensitivity which contects me to the subject matter. Other viewers have been taken by the depth of her artistic talent. I will definitely see her current display and I encourage others to take a look ! By mistake, I misspelled "Atlanta and connects" above. Missing Lori's exhibit would be another mistake :>).